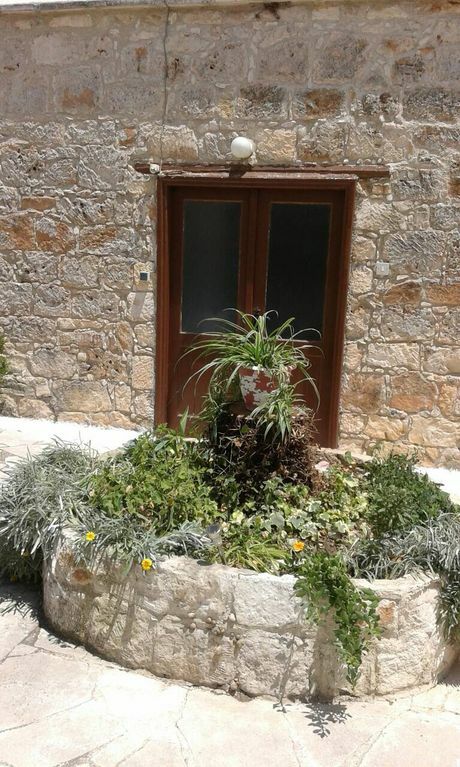 Ye Olde Mill is situated in the village of Kathikas, in Pafos. Kathikas is at the top of the Laona Plateau 665m above sea level. As such, it enjoys it’s own microclimate, cool, breezy, mostly free of humidity and generally 8 to 10 degrees lower than the lower parts of Cyprus. Easy access to the beach - Latchi to the north, Coral Bay to the west, both around 15 minutes by car, as well as easy access to Akamas National Park, Lara Bay Turtle Conservation Station and Avacas Gorge. Ye Olde Mill consists of a kitchen, living room, one double bedroom and a bathroom. The living room furniture includes a sofa-bed for a helper, nurse, guide etc. The kitchen is fully equipped with pots and pans, crockery, cutlery, and cups. There is a cooker, an oven, a fridge/freezer, a washing machine, a microwave oven, an electric drinks mixer, and other small utensils. Although breakfast in not included, Magda will always make sure you are met with some essentials, (milk, coffee/tea, cheese, wine, some sweets or savouries). There is also a dining table with four chairs. The kitchen back door opens to a little green area where a small table and chairs will allow you to relax in the summer breeze. The bed room has an in-built spacious wardrobe and extra blankets should you need them. The bathroom has a wash-hand basin (with a big mirror), WC pan and a shower. Clean towels are provided on arrival, as is some handmade herbal soap made by Michael and Magda’s son Tony. Some shower gel, shampoo and conditioner will also be provided to cater for the first 3-4 days. For longer stays you might want to bring your own. A highly efficient Solar Panel installation, recently installed up on the roof provides running hot and cold water at all times of day or night. Sunshine is constant and plentiful in our area, but, should it be necessary, there is also an electric water heater immediately at hand. The outside space is ideal for sunbathing, having breakfast or just relaxing. There you will find a table, four chairs and two deck-chairs in a feast of shades of green all around you. Free wifi and private parking available (no booking necessary). Having done commercial studies, and having spent over 40 years in the business world in various managerial positions, I strongly believe in customer satisfaction orientation. All my guests, so far, recognised and appreciated this principle. It offers pleasant and peaceful stay for the rest seekers. Most convenient location in serene surroundings. Just a few minutes walk to all village entertainment areas, restaurants, bars, cafes, as well as other facilities such as grocery shop, ATM point, hairdressers, beauticians, post office, medical centre, souvenir shop etc. Furthermore, less than 20 minutes drive to the northern and/or western beaches for swimming, fishing or other sea sports, as well as nearby a beautiful pine tree forest for picnics. Shower, toilet, wash basin with shelving and a large mirror, with all toiletries provided for the first couple of days of stay. Dining area is in the kitchen and open space (patios) front and back of property. A small selection of Greek and other language books. Although breakfast in not included, Magda will always make sure you are met (on arrival) with some essentials, (bottled water, milk, coffee/tea, seasonal fruit, cheese, wine, some sweets and other savouries). Clean towels are provided on arrival, as is some handmade herbal soap made by Michael and Magda’s son Tony. Some shower gel, shampoo and conditioner will also be provided to cater for the first 3-4 days. For longer stays you might want to bring your own. Some houses in Kathikas are over a century old and serve as examples of folkloric architecture.